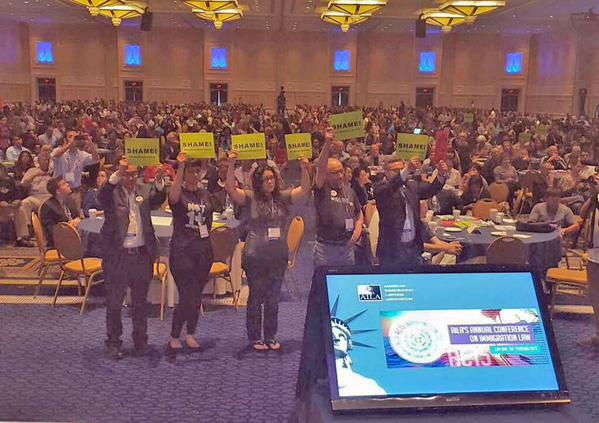 White House advisor, Cecilia Muñoz, was met with silence, jabs and jeers, and booed off the stage at the annual American Immigration Lawyers Association (AILA) conference yesterday. 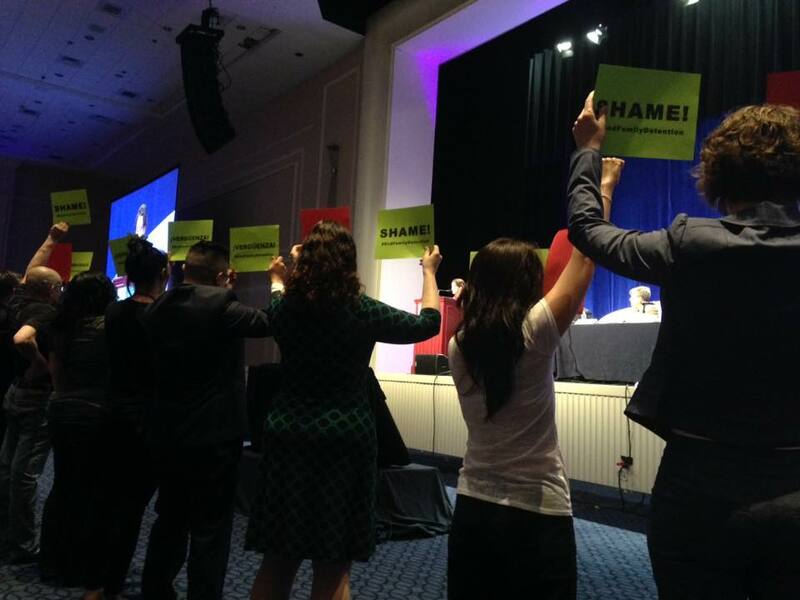 Several immigration attorneys and advocates who have been at the frontlines of the fight to end the detention of refugee mothers and children stood up in the front of the room with signs declaring ‘Shame’ in response to how the Obama Administration has been treating these refugees. Muñoz took the stage at the annual conference with classic political speech. She praised the audience for their work, touted past achievements of the Administration such as the executive action announcements of November 2014, and deflected criticism onto Republicans. By the end of her speech though, she appeared flustered and frustrated by the constant berating comments from immigration attorneys. “You’re jailing children!” exclaimed attorney Sheila Starkey, while holding up a photo of a boy with the word “Shame” on it. Several other attorneys started chanting “End Family Detention” and Muñoz responded by stating that “Not One More” was a catchy slogan, but not an enforcement strategy, and implored advocates to work with the Administration to craft an enforcement strategy. Instead of targeting efforts for justice like Not1More, Muñoz should’ve taken this opportunity to announce an end to immigrant detention. The White House’s job to make immigration policy more humane is far from complete and we will continue to push this administration. It is a bit strange and out of touch for the White House to take cheap political shots at the very campaign that has helped to shape immigration enforcement policy. The comment also indicates that the Administration is not serious about making tangible changes to the enforcement machinery that advocates have been demanding for a while: reducing deportations, ending incarceration of families, restoring due process for asylum seekers, and eliminating the detention of vulnerable populations. Muñoz should have used the platform provided to her at the annual conference to announce further reforms to the enforcement machinery as listed above. By not doing so, and trying to deflect criticism onto the GOP and grassroots organizers, her speech failed to be anything more than self-serving.